There are sometimes when the cheerleaders are more exciting than the actual sports game. The various uniforms, dances and crazy cheer splits are among the favorites during half-time shows. However, there are certain times when the uniforms deserve all the attention. Due to the physical exertion involved with cheering because of the running, flipping and splitting, it can cause a variety of wardrobe malfunctions. The list below provides some insight on hilariously shocking cheerleader uniform faux pas. Take a look and prepared to be blown away by some of these flabbergasting cheerleader wardrobe mishaps. These cheerleaders are clearly bending at the knees backward. Lifting your legs is cool, if you can hold everything inside. These cheerleaders shopped in the baby section of the store. 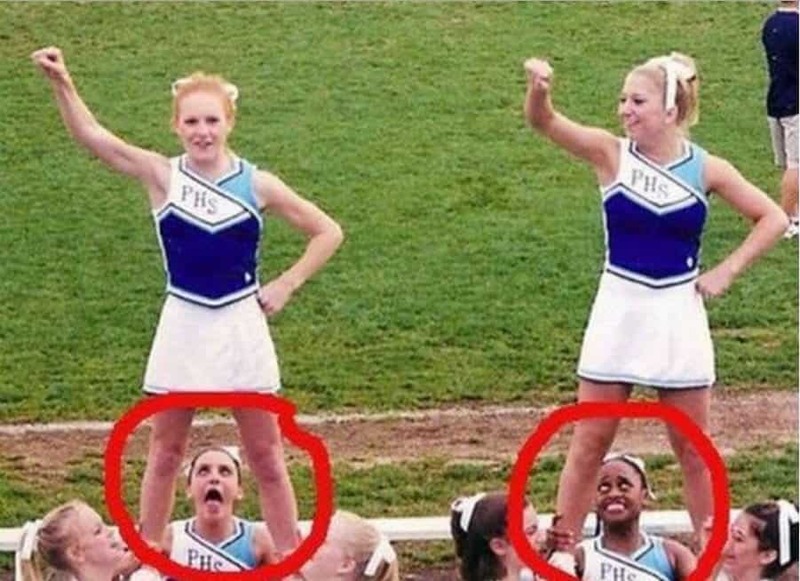 This cheerleader should have paid more attention to the bottom half of her body, instead of trying to perfect her smile. She had to find a place for her phone because clearly, cheerleader outfits don’t have pockets. This cheerleader was so excited, she lifted right out of her top. This cheerleader was a little too excited with her pom-poms. These leg lifts just happened to be in sync with the camera snap. She either wasn’t aware that it was that time of the month, or she really had to go to the bathroom. Either way, this had to have been the most embarrassing moment of her life. Clearly, these two ladies forgot most of their undergarments. These ladies must have missed their toddler years. These cheerleaders forgot to put on their spanks. The designer of these uniforms must love cartoons. Maybe this cheerleader was going with the one shoulder strap uniform look, instead of two. Who says cheerleaders have to wear underpants? Just a peak at the rainbow. Just a little puffy in all the wrong places. Their hands will never be the same. The cell phone helped ease the pain of exercise during cheer practice. Everyone likes to ride the horses once in a while.